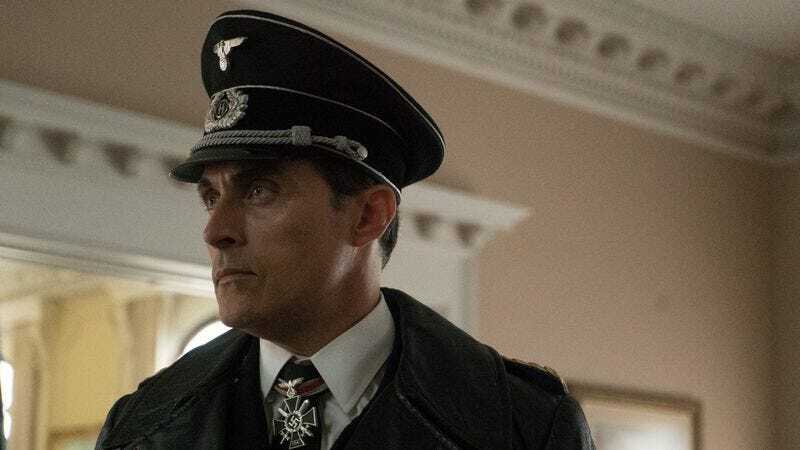 With a title like “Fallout,” The Man In The High Castle’s season finale could have gone the literal route, giving us the nuclear blast that’s been threatened all along. Instead, the fallout is of the metaphorical variety, dealing with the consequences of the penultimate episode’s major events and decisions. It’s a satisfying hour in some ways and a troubling one in others. The shift in depiction of John Smith from murderous Nazi officer to family man just making the best of a bad situation gets a boost from a pre-credit sequence set in December 1945, when Smith (dressed in American military attire) and a very pregnant Helen witness the destruction of Washington DC. (We did get that nuclear blast after all, albeit one that happened long ago.) For all his manipulations and ruthlessness, it is Smith who emerges as one of the season’s heroes, along with the equally unlikely Kido and (if you buy into what the Man in the High Castle is selling at the end) Juliana. Moral ambiguity permeates the finale, except that it plays more like moral confusion, as if the leaderless creative team isn’t quite in control of the tone. What has the Resistance accomplished? They destroyed a building and killed a lot of people (including, it turns out, General Onada), but that only serves to leave Kido as the highest-ranking official and the existing power structure intact. In New York, George Dixon’s plan is to release his copy of the recording of Juliana’s talk with Thomas about his condition, thus undermining John Smith’s credibility and legitimacy. He has the big picture in mind, but Juliana only sees what’s in front of her: a sick kid who deserves the chance to grow up and become something other than a Nazi, unlikely as that might be. She kills Dixon and gets the tape from his body before fleeing for the Neutral Zone. Thomas, meanwhile, finally gets the truth from his father: he has a form of muscular dystrophy for which there is no cure. In Nazi terms, he’s a useless eater, something he believes despite his parents’ denials. At least he’s not hypocrite: he recognizes that they’d condemn anyone else in his position to death without a second’s thought. In the end, he turns himself in to the Public Health Department, fulfilling Dixon’s ultimate goal despite Juliana’s intervention. Their plan plays out in suspenseful fashion, even as it requires some suspension of disbelief. 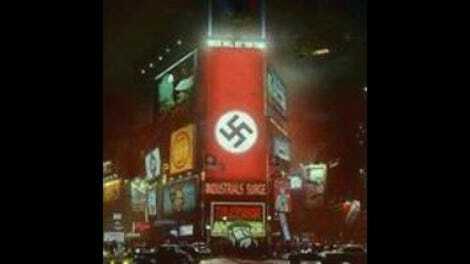 Is Hitler really the only one in the Reich who knew about the Man in the High Castle’s films? That doesn’t really jibe with the series to date, in that the films always seemed to be pretty common knowledge. (What mission did these people think they were congratulating Joe for pulling off?) Of course, if more people in the Reich know about the films, the bluff can’t possibly work, so we have little choice but to accept this bit of handwaving. It turns out Smith has another trick up his sleeve: evidence that Heusmann was part of a conspiracy that poisoned Hitler. Heusmann is arrested and poor, dumb Joe is disillusioned again. Grafting this hero narrative onto John Smith is annoying enough, but the convoluted reasoning offered up by Abendsen when Juliana encounters him in the Neutral Zone is particularly head-scratching. He tells her that all the realities depicted in the films have one thing in common: Juliana is the key to San Francisco’s survival. Her compassion for a sickly Nazi boy, as misguided as it might seem, turns out to be the thing that saves everyone. In killing Dixon, she gave Smith the time to make his trip to Berlin, averting the war. So…those who organized to fight oppression would have only brought about destruction if not for the intervention of a Nazi sympathizer? That’s just great. Of the Resistance characters we’ve gotten to know, only Lem, who we’ve hardly glimpsed since early this season, is accorded a measure of dignity. He shows up at Tagomi’s door with a box of films, a turn of events open-ended enough that new showrunner Eric Overmyer could take it in any number of directions. It would be foolish to make any predictions with such a significant shake-up at the top of the creative team, but here’s hoping Overmyer thinks through the implications of his storytelling decisions with a clarity the second season too often lacked. Oh, and Trudy’s alive. Or at least a Trudy, if not necessarily the one Juliana remembers. Frank’s status, however, remains up in the air. The last we see of John Smith, he’s being led into a vault of films, meaning…others in the Reich do know about the films?